Welcome to the Books for Psychology Class Blog. The goal of this blog is to share books that would be useful in an introductory psychology class for both instructors and students. We encourage anyone who is interested to submit reviews of books they would recommend. If you would like to contribute to this blog, information can be found on the tab labeled contact/submissions. Please e-mail us at laurabrandt85@gmail.com or fenton598@gmail.com or jflitter1@gmail.com if you have any questions. 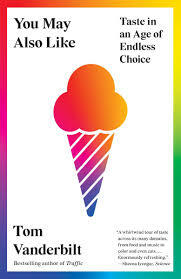 Click on the photo of the book you are interested in and you will be taken directly to the blog posting for that book. We like to believe that our choices represent our uniqueness and individuality. We believe that our choices in clothes, music, and food is shaped almost exclusively by our experiences and personal preferences. Tom Vanderbilt argues that much our likes and dislikes are shaped by others. If we read restaurant reviews that begin positively, we are more likely to rate the restaurant positively. We like music that we hear over and over again and even if your spotify playlist has 120,000 songs, you probably listen to about 100. Advertisers suggest that girls should like pink and boys blue so we often adopt those expectations without every thinking about what is is that we really like. The endless choices we have today can be overwhelming and we need to rely on the opinions of others to navigate was is good and was is less good, even if we still want to believe we bought that hawaiian shirt on vacation because we really loved the print. Hans Rosling, and expert on public health leaves a legacy for his life’s work in his last effort to let people know that the World is a much healthier and safe place than it has ever been in the past. Rosling uses the data collected from the World Health Organization, the United Nations, the Red Cross, his own data and multiple other sources to demonstrate that what we think about the world is often far worse than what actually occurs. Rosling in part blames this misunderstanding to the media who feature sensationalist and often negative stories that will capture the attention of viewers and readers. In addition, Rosling believes that those in the Westernized cultures still see the world as binary; rich versus poor or sick versus healthy. The reality is that most people today live in middle-income families and do not differ as much as many people believe. The accompanying website features data rich information into many public health issues and Rosling`s TED talk demonstrates a great interactive model of correlational research. 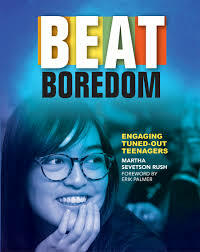 Beat Boredom is a guide from a veteran teacher that provides detailed and specific ideas for helping students stay engaged and master difficult material. Martha Sevetson-Rush is a master teacher who was a journalist before spending twenty-five plus years in the classroom teaching journalism, language arts, United States history, economics, personal finance, government, and psychology. Currently, she teaches AP Psychology as well as AP Microeconomics and AP Macroeconomics. Sevetson-Rush articulates the causes of disengagement and boredom and provides concrete solutions for use by instructors across a variety of disciplines. If you are interested in learning more about these books and many others, click on the Blog link at the top of the page. Each of the book review postings includes a brief explanation of the book, a related classroom activity, key psychological concepts referenced in the book, and other resources such as websites or podcasts.